or know a friend who has never tried Google Docs because they don’t have a Google Account, you can now take Google Docs for a test drive with the new Google Docs demo. This lightweight demo includes a sample document, spreadsheet and drawing and works even if you aren’t logged into a Google Account. 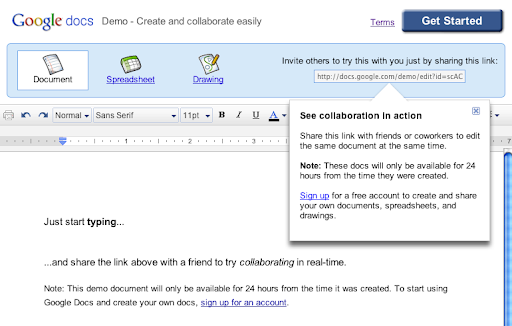 Instead of trying to explain to friends how real-time collaboration in Google Docs works, now you can show them. All you have to do is go to docs.google.com/demo, share the link over chat or email, and start typing. Real-time character by character co-editing in documents, cell presence in spreadsheets and instant updates in drawings are all seconds away. Take it for a spin and let us know what you think in the comments. If you’ve been holding off on trying our new editors or know a friend who has never tried Google Docs because they don’t have a Google Account, you can now take Google Docs for a test drive with the new Google Docs demo. This lightweight demo includes a sample document, spreadsheet and drawing and works even if you aren’t logged into a Google Account.